©1990, 2004 TSR, Inc., c. 2004 Wizards of the Coast, Inc. (P)2013 Audible, Inc. I loved this book. Full of action, tension, and vivid imagination. The narrator did well. This book and the subsequent ones are packed with adventure. I love them! The narrator has amazing tone and cadence and carries the story effortlessly through to its conclusion. He changes voices for each character and makes it so easy to follow. I wish he read all the books I listen to. This book is a favorite of mine for many years. 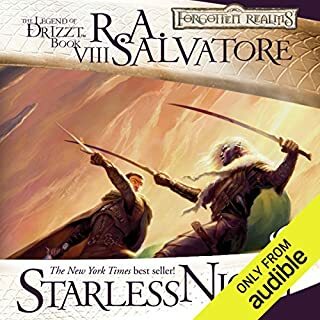 Drizzt's development is fantastic, showing that you can't always judge a book by its cover. Performance was a bit weak; I feel this should have multiple readers but it is serviceable. 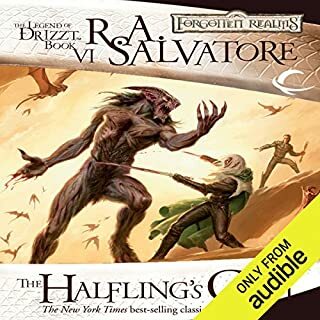 In his follow up to the The Halflings gem Salvatore takes us on a journey back to the Origins of Drizzt. We see as the stoic ranger is born into the devilish world of Menoberanzan and its evil matriarchal society. The Drow are passionless killers, and Drizzt has to navigate their society without losing his soul to the evil spider queen Lloth. The story begins on the the night of his birth when the Du'Orden armies launch a raid against House De'Vir, to move one step closer to the ruling council. The story follows Drizzt and his relationship with his family and the discovery of how truly vile his society is. Drizzt is, by far, the most iconic drow character in fantasy literature. He's so popular that within the circles of roleplaying gamers, both tabletop and computer, it's a common joke that every drow is a two-sword wielding goodie goodie, despite their race's fierce reputation. Players will name their characters in an homage to Drizzt, just as they might with Legolas or Gandalf. That's some high praise, right there. 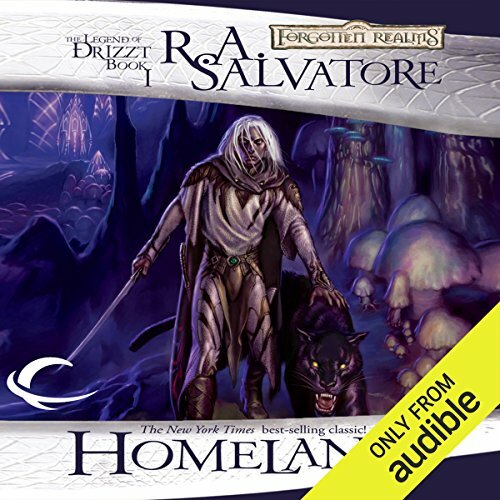 Homeland is the first book of the Dark Elf Trilogy and the (truly massive) Legend of Drizzt Saga. 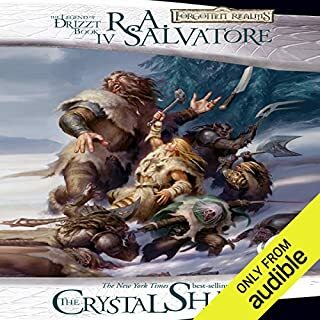 While it's not the first appearance of Drizzt, it's the place for new readers to start, because here you'll learn of both his origins and his background. Homeland describes the City of Menzoberranzan, home of the drow, and the struggles for power that take place there. If you've never read a book about the drow, you'll quickly find that there's a lot to learn here. 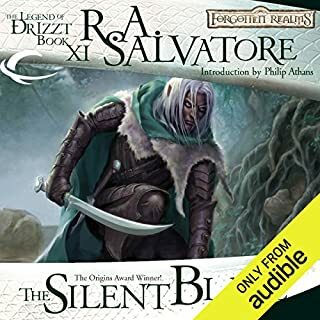 Salvatore assumes that the reader is unfamiliar with his setting, and he exposes the reader to the atrocities committed in the name of drow culture through the eyes of the naive and innocent Drizzt. By the end of the book, you will have a good feel for what the drow are all about, and likely be hungry for more of their plots and intrigue. The story features many interesting characters: the insidious matron Malice, the vengeful Alton Devir, the noble Zaknafein. Drizzt is the primary hero, but to be perfectly honest, I found his character arc the weakest in the book. His naïveté and indomitable innocence are meant to be his best qualities, but I felt robbed of the potential for a redemption story that could have made him much more interesting. Surrounded by characters who are falling into ruin through their own actions or finding spiritual redemption for their crimes, Drizzt's transition from naive to slightly-less-naive doesn't feel very spectacular. This is, however, a matter of taste. The tone of this novel really sets up the heroic tone the larger series is known for. As for the delivery, Bevine does an admirable job. I have quibbles on pronunciation, here and there, but since all of these words were born on paper, there probably is no solid agreement on any of them. Bevine does a good job of transitioning between the harsh calculating characters like Matron Malice and the more idealistic Drizzt, which is rather impressive. 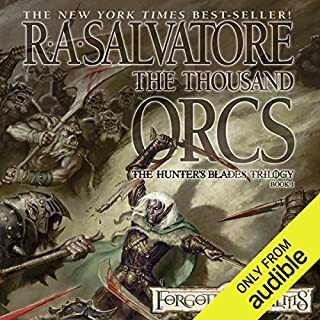 Ultimately, if you are interested in learning more about the drow or getting into the Drizzt series of novels, this is a great place to start. The intrigue and plots are interesting, but there's enough action to keep you interested if that's more your speed. Salvatore can barely be called competent as a writer (at the time he wrote this book), but he doesn't need to be. Some people want masterpieces, others want entertainment, this book deliver plenty of entertainment. Drizzt and I "met" when I was entering my teen years, and listening to Drizzt's adventures made my life that much richer. When I first heard the audiobooks, the recordings was a cassette-rip that was unbearably bad. 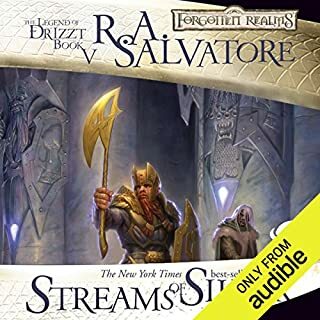 This re-recording gives me the opportunity to pay for me enjoying the adventures of Drizzt, but also one that sounds great. I can recommend this book (and it's sequels) to anyone who like some great entertainment wile taking the bus or jogging. It's easy to follow, narrated excellently and gives anyone between 10 and 100 a magical world to be carried away to, from the mundanity of everyday life. If you are looking for a good fantasy series, with Elves, Dwarves, Humans, and all kinds of fantasy creatures, all wielding Magic, and with lots of action, you just can't go wrong with this series. It is the Motherlode. 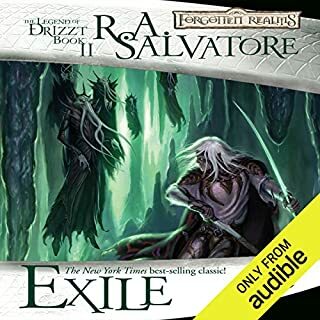 R A Salvatore has created so many excellent books about Drizzt and his companions that it is like an banquet. Victor Bevine does an excellent job of narrating, too. He brings the characters to life for me. A 'Must Have' For Any Audible Fantasy Library! I'm noticing that the more I love an author's work, the longer the review. So, strap in. And be warned. This will NOT be short. This work deserves a detailed review. You deserve more than a cursory review on this series. Keep in mind that I read this series many, many years ago, and began writing this review in the hopes that once I listened to it as soon as it hit my library, it would be a positive work. And it is. I'm glad, because I also was ready to give it a scathing review if poorly produced. First a bit of background on the author. 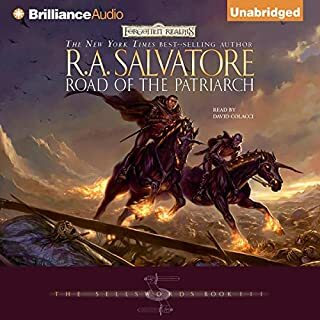 I've thoroughly enjoyed R.A. Savaltore's fantasy writing for many years, and consider a fair portion of his writing (and listening) to be essential additions to any Audible listener's library. Granted, no author's entire body of work is perfect, and Salvatore' is definitely NOT an exception to this tried and true literary rule. Some of his earlier work reflects an author still finding his way, and is uninspired and drifting. However, when he penned the Drizzt origin trilogy, he moved into a more masterful and inspired writing direction, creating dynamic and page-turning writing enjoyed by fantasy readers and listeners around the world. Today, Salvatore is, essentially, a stand-apart Wordsmith among the myriad of fantasy authors to whom you've listened. Anyone who's read his DemonWars Saga, his Forgotten Realms, and Star Wars novels understands why I appreciate what this fantastic author brings to the literary table. So, on to this first in the Drizzt origin trilogy. 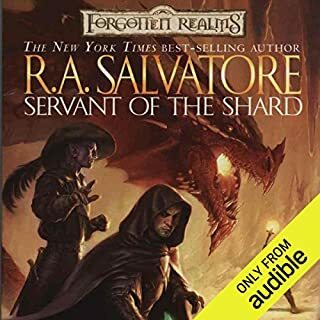 Why is this series so important, and therefore, such an essential fantasy addition to your Audible library? Salvatore's trilogy has some of the most engaging fantasy writing you'll quite possibly read. 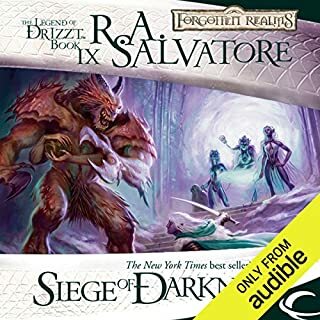 His sweeping and vivid descriptions of Menzoberranzan, the cavernous underdark kingdom of the drow elves, the intricate machiavellian backstabbing plots between the drow ruling houses, and even within Drizzt's own horribly dysfunctional family, and the spot on engaging storyline were well received by the public. The trilogy eventually launched numerous sequels and novels by Salvatore and other enjoyable novels in the crow universe by equally inspired authors (See my Audible Spider Queen series review, and expect my Icewind Dale review in the future!). This fantastic body of work has made a HUGE impact on modern epic fantasy, and it raised the bar on what we could, and SHOULD, expect from good fantasy writing. And in this case, our very valuable Audible credits. I challenge you - Go look on the web for the astounding collection of information and lore on the lore of these novels. It's rich. It's daunting. It's exhausting. it's consuming. Now, on to Salvatore's writing style. He's not an Erikson or Moorcock. Those artists take their time in descriptive writing that requires strong focus to be enjoyed. Salvatore's style is more like the lovechild of Brooks and Chalker - Down to earth, a bit more to the point, yet vividly descriptive. I found myself getting wonderfully lost inside this trilogy, and I'm betting you will too. Keep in mind that years ago, there was an earlier audiobook of this trilogy. It was intolerable, due to the unpleasant narration - It truly ruined the effort. I stayed up late to download this audiobook, and begin my listening. Here, the narrator is much better, and doesn't impede the author's work. Nicely done, and a wonderful improvement, Mr. Bevine! So, be warned, dear Audible listener. You're going to be spoiled by this work, and you're going to demand equally good listening of your fantasy authors. 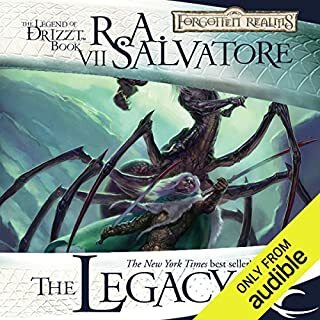 You'll also want to get the other two audiobooks in this fantastic series, and want the rest of the drow audiobooks here at Audible. Finally, a tremendous "Thank you!" To R. A. Salvatore. I'm still enjoying your journey after all these years. Glad this is finally available! Would you listen to Homeland again? Why? Absolutely! And I can't wait to hear the other novels in this series (and all of R.A. Salvatore's other works as well). Books by D&D authors sometimes go unnoticed and unread because people think they are "toy books" or "gaming non-sense". NOT TRUE. The books by Salvatore are quite in-depth, exciting and wonderfully written. You can loose yourself in his combat scenes, feeling the moment rather than reading (or listening) to it. 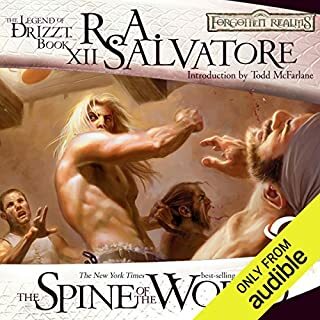 Victor Bevine's Drizzt was wonderful, but he brought Zaknafein to life for me.I was certainly glad he didn't affect any silly Earth-ly "accents" in his reading. A faked Irish or Scottish accent would have destroyed this work. Victor Bevine did a 5 Star job with this novel. I certainly hope he reads more of these works! 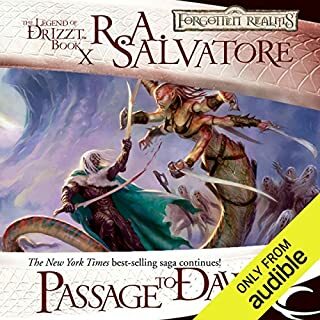 I read this book years ago when it was first printed, having been an R.A. Salvatore fan (hooked since The Crystal Shard, his first work), and I was pleasantly surprised to see this wonderful work made available on Audible. The books of Salvatore were my mainstay reading when I was beginning my journey into the fantasy world of The Forgotten Realms, at my own gaming table and on my bookshelf. this is a WIN for Audible Frontiers! I was somewhat worried before buying this book, due in large part to the butchering Audible gave to the Dragonlance Chronicles, which, like this series, I'd read when I was younger. 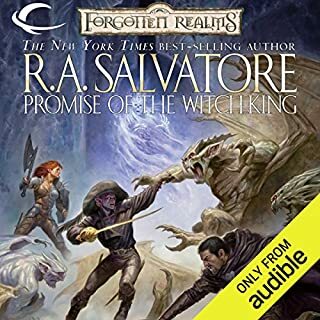 Also, I'd tried reading/listening to Salvatore's Neverwinter Saga, and found it overly dramatic and simple (considering it's a lead-in to a computer game, and I'd heard Salvatore wasn't too happy about writing it the way his publishers wanted, it may not be his best effort). 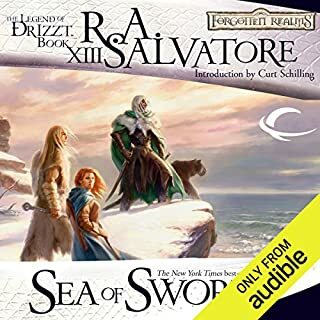 But, having loved this series and the Icewind Dale trilogy years ago, I decided to give it a shot in audio, wanting to re-experience these stories. 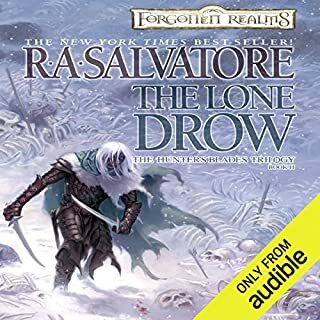 Victor Bevine's narration is very good- he conveys both the emotions of the characters and the urgency of a battle scene very well, and overall delivers a great listening experience. And, in my opinion, Salvatore's early work is superior to his later novels. If you're expecting a lot of politicking and other "tedium" that can slow down other books, you may be disappointed. These books are fast-paced and action-packed. Salvatore's writing style is different from the likes of Jordan, Sanderson, and Erikson (all of whom I enjoy), but that is not a negative. They're just plain fun. I can't wait for the next books to be released. And that doesn't happen too often. If you could sum up Homeland in three words, what would they be? It took a bit to get all the background of the story but it is a series and as the story goes on, it gets better and better. It is dark and cruel but our hero emerges and there is hope. I think when Zack and Drizzt's last 'fight'. They come to the knowledge of what they are to each other and it is touching. Yes, when Drizzt and his cat leave, they leave as friends together. Doesn't sound like much, but in their world, friendship and loyalty to one another is unheard of. I actually listened to this a couple of times before I really got into the story but am glad I took the time. I will continue the series. Fantatic Entry into Audible Fantasy for me! In a few years when the material isn't so fresh in my mind, absolutely! Drizzt, he's a character out of his own culture and a powerful fighter. He's a character everyone would want to be like. Different convincing voices for each character. It was just a fun listen from start to finish. I've been listening to a lot of Sci-fi because thats my scene. 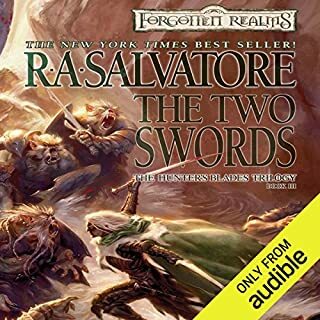 However, the first novel I ever read cover to cover was written by R.A. Salvatore and it was riveting to me as a teen and I could barely put it down. I remembered the author when I seen this book on a friends shelf and thought I need to see if Audible has that title. 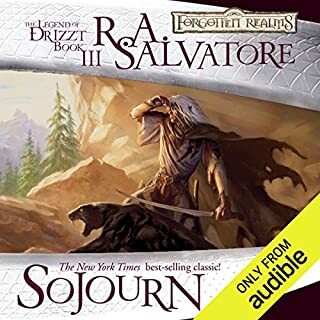 This is the origin story of a very fun character and it is a very fun great read I'm excited to read the rest in this series and to follow the adventures of Drizzt Do'Urden. Can't put it down! Again!! Would you consider the audio edition of Homeland to be better than the print version? Yes, I drive for work so audio books are awesome! What other book might you compare Homeland to and why?